Florida school buses carry precious cargo – our children. Motorists should always be alert and drive with caution around school buses and in school zones where children may be present like schools, bus stops, school buses and school parking lots. Parents should also go over safety tips with their children to make sure they are safe on and around school buses and school zones. 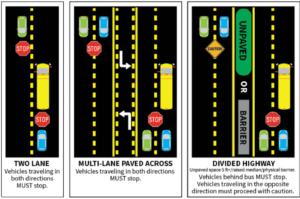 On a highway divided by a raised barrier or an unpaved median at least 5 feet wide, drivers moving in the opposite direction do not have to stop for the bus (painted lines or pavement markings are not considered barriers). However, these motorists should slowdown and watch for students loading or unloading from the bus. On July 1, 2017, the Cameron Mayhew Act took effect in Florida, which increases the minimum penalty for drivers who illegally pass a stopped school bus, resulting in the injury or death of another person. Cameron Mayhew was killed by a motorist that failed to stop as he was walking to his stopped school bus in 2016. Arrive at the bus stop with about five minutes before the bus is scheduled to arrive. At bus stops, children should wait in a safe place away from the road. Never sit on the roadway or curb while waiting for your bus. Make sure your children know their bus driver’s name and bus number. Tell children to never speak to strangers at the bus stop or get into the car with a stranger. Children should tell parents, the bus driver and a teacher at school if a stranger tries to talk to them or pick them up. Children should never walk behind a bus and should stay away from bus wheels at all times. When the bus stops, children should wait for the driver’s signal that it is safe to cross the road or board the bus. Children should look both ways before crossing the street- look left, right and left again. Tell them to make eye contact to make sure the bus driver can see them as they cross the street. On the bus, children should remain seated at all times and keep the aisle clear. Tell children not to put their head, hands or arms out the window. Remind children to stop talking and remain silent when the bus comes to a railroad crossing so the driver can hear if a train is approaching. Children should avoid any loud or disruptive behavior that could distract the bus driver from safely operating the bus.